Jeep is an automobile marque (and registered trademark) of Chrysler. Many people treat the word "jeep" as a generic term and use it uncapitalized for any vehicle of this shape and function: see genericized trademark. Roads that are only suitable for off-road vehicles are often called jeep trails. The most famous is the Rubicon Trail located near Lake Tahoe in Nevada and in California. The so-called "Jeep Trail Capital of the World" however is Ouray Colorado (that is the Ouray town motto). Ouray serves as a Hub to Mountain Passes such as Engineer Pass, Cinnamon Pass, Imogene Pass, and the infamous Black Bear Pass. There are many stories about where the word "jeep" came from, how it was coined, These, although they make for interesting and memorable stories, are difficult to verify. Probably the most popular notion has it that the vehicle bore the designation "GP" (for "General Purpose"), which was phonetically slurred into the word jeep. R. Lee Ermey, on his television series Mail Call, disputes this, saying that the vehicle was designed for specific duties, was never referred to as "General Purpose," and that the name may have been derived from Ford's nomenclature referring to the vehicle as GP (G for government-use, and P to designate its 80-inch-wheelbase). "General purpose" does appear in connection with the vehicle in the WW2 TM 9-803 manual, which describes the vehicle as "... a general purpose, personnel, or cargo carrier especially adaptable for reconnaissance or command, and designated as ¼-ton 4x4 Truck", and the vehicle is designated a "GP" in TM 9-2800, Standard Military Motor Vehicles, September 1, 1943, but whether the average jeep-driving GI would have been familiar with either of these manuals is open to debate. This version of the story may be complicated by the name of another series of vehicles with the GP designation. The Electro-Motive Division of General Motors, a maker of railroad locomotives, introduced its "General Purpose" line in 1949, using the GP tag. These locomotives are commonly referred to as Geeps, pronounced the same way as "Jeep". Many, including Ermey, claim that the likelier origin refers to the character Eugene the Jeep in the Thimble Theater (Popeye) comic strip. Eugene the Jeep was dog-like and could walk through walls and ceilings, climb trees, fly, and just about go anywhere it wanted; it is thought that soldiers at the time were so impressed with the new vehicle's versatility that they informally named it after the character. The character "Eugene the Jeep" was created in 1936. The term "jeep" was first commonly used during World War I (1914-1918) by soldiers as a slang word for new recruits and for new unproven vehicles. This is according to a history of the vehicle for an issue of the U.S. Army magazine, Quartermaster Review, which was written by Maj. E. P. Hogan. He went on to say that the slang word "jeep" had these definitions as late as the start of World War II. "Jeep" had been used as the name of a small tractor made by Modine. The term "jeep" would eventually be used as slang to refer to an airplane, a tractor used for hauling heavy equipment, and an autogyro. When the first models of the jeep came to Camp Holabird for tests, the vehicle did not have a name yet. Therefore the soldiers on the test project called it a jeep. Civilian engineers and test drivers who were at the camp during this time were not aware of the military slang term. They most likely were familiar with the character Eugene the Jeep and thought that Eugene was the origin of the name. The vehicle had many other nicknames at this time such as Peep and Pygmy and Blitz-Buggy, although because of the Eugene association, Jeep stuck in people's minds better than any other term. Words of the Fighting Forces by Clinton A. Sanders, a dictionary of military slang, published in 1942, in the library at The Pentagon gives this definition: Jeep: A four-wheel drive car of one-half to one-and-one-half ton capacity for reconnaissance or other army duty. A term applied to the bantam-cars, and occasionally to other motor vehicles (U.S.A.) in the Air Corps, the Link Trainer; in the armored forces, the ½ ton command car. Also referred to as "any small plane, helicopter, or gadget." Early in 1941, Willys-Overland demonstrated the vehicle's ability by having it drive up the U.S. Capitol steps, driven by Willy's test driver Irving "Red" Haussman, who had recently heard soldiers at Fort Holabird calling it a "jeep". When asked by syndicated columnist Katherine Hillyer for the Washington Daily News (or by a bystander, according to another account) what it was called, Irving answered, "It's a jeep." Katherine Hillyer's article was published on February 20, 1941 around the nation and included a picture of the vehicle with the caption: LAWMAKERS TAKE A RIDE- With Senator Meade, of New York, at the wheel, and Representative Thomas, of New Jersey, sitting beside him, one of the Army's new scout cars, known as "jeeps" or "quads," climbs up the Capitol steps in a demonstration yesterday. Soldiers in the rear seat for gunners were unperturbed. This exposure caused all other jeep references to fade, leaving the 4x4 truck with the name. Willys-Overland Inc. was later awarded the sole privilege of owning the name "Jeep" as registered trademark, by extension, merely because it originally had offered the most powerful engine. The first jeep prototype (the Bantam BRC) was built for the Department of the Army by American Bantam in Butler, Pennsylvania, followed by two other competing prototypes produced by Ford and Willys-Overland. The American Bantam Car Company actually built and designed the vehicle that first met the Army's criteria, but its engine did not meet the Army's torque requirements. Plus, the Army felt that the company was too small to supply the number needed and it allowed Willys and Ford to make second attempts on their designs after seeing Bantam's vehicle in action. Some people believe that Ford and Willys also had access to Bantam's technical paperwork. Quantities (1500) of each of the three models were then extensively field tested. During the bidding process for 16,000 "jeeps", Willys-Overland offered the lowest bid and won the initial contract. 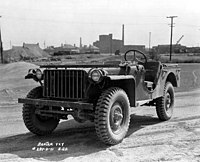 Willys thus designed what would become the standardized jeep, designating it a model MB military vehicle and building it at their plant in Toledo, Ohio. Like American Bantam, Willys-Overland was a small company and, likewise, the military was concerned about their ability to produce large quantities of jeeps. The military was also concerned that Willys-Overland had only one manufacturing facility: something that would make the supply of jeeps more susceptible to sabotage or production stoppages. Based on these two concerns, the U.S. government required that jeeps also be built by the Ford Motor Company, who designated the vehicle as model GPW (G = governmental vehicle, P showed the wheelbase, and W = the Willys design). Willys and Ford, under the direction of Charles E. Sorensen (Vice-President of Ford during World War II), produced more than 600,000 jeeps. Besides just being a "truck" the jeep was used for as many purposes as you can think of. The jeep was widely copied around the world, including in France by Hotchkiss et Cie (after 1954, Hotchkiss manufactured Jeeps under licence from Willys), and by Nekaf in the Netherlands. There were several versions created, including a railway jeep and an amphibious jeep. As part of the war effort, Jeeps were also supplied to the Soviet Red Army during World War II. In the United States military, the jeep has been supplanted by a number of vehicles (e.g. Ford's M151 MUTT) of which the latest is the High Mobility Multipurpose Wheeled Vehicle (HMMWV or "Humvee"). A division of Chrysler Holdings, the most recent successor company to Willys, now holds trademark status on the word "Jeep" and the distinctive 7-slot front grille design. The original 9-slot grille associated with all WW2 jeeps was designed by Ford for their GPW, and because it weighed less than the original "Slat Grille" of Willys, (an arrangement of flat bars) was incorporated into the "Standardized jeep" design. The marque has gone through many owners, starting in 1941 with Willys, which produced the first Civilian Jeep (CJ). Willys was sold to Kaiser in 1953, which became Kaiser-Jeep in 1963. American Motors (AMC) purchased Kaiser’s money-losing Jeep operations in 1970. The utility vehicles complemented AMC’s passenger car business by sharing components, achieving volume efficiencies, as well as capitalizing on Jeep’s international and government markets. The French automaker Renault began investing in AMC 1979. However, by 1987, the automobile markets had changed and even Renault itself was experiencing financial troubles. At the same time, Chrysler Corporation wanted to capture the Jeep brand, as well as other assets of AMC. Chrysler bought out AMC in 1987, shortly after the Jeep CJ was replaced with the AMC-designed Jeep Wrangler or YJ. Chrysler merged with Daimler-Benz in 1998 to form DaimlerChrysler. DaimlerChrysler eventually sold most of their interest in Chrysler to a private equity company in 2007. Chrysler and the Jeep division now operate under the name Chrysler Holding LLC. Toledo, Ohio has been the headquarters of the Jeep marque since its inception, and the city has always been proud of this heritage. Although no longer produced in the same factory as the World War II originals, two streets in the vicinity of the old plant are named Willys Parkway and Jeep Parkway. American Motors set up the first automobile-manufacturing joint venture in the People's Republic of China on January 15, 1984. The result was Beijing Jeep Corporation, Ltd., in partnership with Beijing Automobile Industry Corporation, to produce the Jeep Cherokee (XJ) in Beijing. Manufacture continued after Chrysler's buyout of AMC. This joint venture is now part of DaimlerChrysler and DaimlerChrysler China Invest Corporation. The current model is the Jeep 2500, an updated XJ Cherokee. Jeep vehicles have "model designations" in addition to their common names. Nearly every civilian Jeep until the mid-2000's has a 'xJ' designation, though not all are as well-known as the classic CJ. Chrysler has now changed to an "xK" designation. Total, there have been 322579 visitors (1096321 hits) on this page!